← I’m Not Worried, You’re Worried. 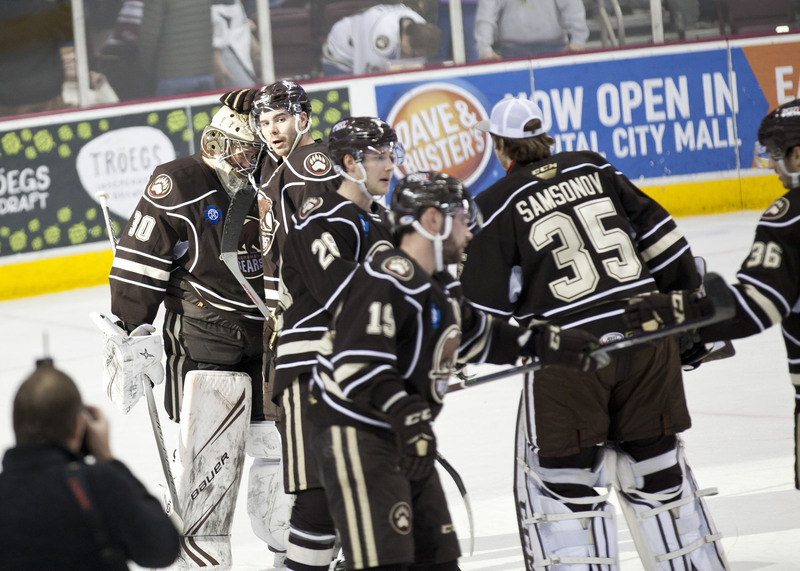 The Hershey Bears beat the Laval Rocket 4-2 Saturday night at Giant Center in Hershey. The win improves the Bears record to 21-20-0-3 for the season. The Bears are now over .500 for the first since January 13, 2018. The Bears now break for the 2019 AHL All-Star game, and will return to the ice next Saturday when they host the Lehigh Valley Phantoms at Giant Center. Puck drop is set for 7:00 PM. Nathan Walker would strike first to give the Bears a 1-0 lead at the first intermission. The Bears would add a power play goal from Mike Sgarbossa and a short-handed goal from Beck Malenstyn to take a 3-0 lead, but Laval would answer with a tally for a 3-1 score at the second intermission. The Rocket would close the gap to 3-2 early in the final frame, but Riley Barber would add an empty net goal late for the 4-2 win. Our Photos from the game are here. Scratches: Colby Williams (lower body), Lucas Johansen (upper body), Kris Bindulis (upper body), Steve Whitney (injury) were the injury scratches. Max Kammerer was a late scratch due to Illness. Steve Johnson and Mason Mitchell were the healthy scratches. Lucas Johansen returned to practice on Friday. He has been out of the lineup since November 23rd. The Rocket were benefactors of a power play just 1:05 into the contest after Tyler Lewington was called for boarding, but the Bears penalty kill successfully squashed Laval’s man advantage, allowing no shots on goal. Early 5-on-5 play was fairly even, with Laval leading in shots on goal 1-0 through six minutes of play. The Bears were awarded their first power play at 6:34, and they would capitalize. Nathan Walker would notch the tally at 6:55, his 10th of the season. Mike Sgarbossa (17) and Aaron Ness (26) were credited with the assists. The Bears began to tilt the ice in their favor following Walker’s opening tally. Laval would get their second power play with 1:11 left in the opening stanza, but they would be unable to convert. The first period expired with the Bears leading 1-0. Hershey outshot the Rocket 8-7 for the first 20 minutes. Laval was 0 for 2 and the Bears 1 for 2 on the power play in the first period. The Bears would squash the remainder of Laval’s power play to star the middle frame. The Bears would get their third man-advantage opportunity of the game at the 3:10 of the middle frame, but were unable to convert. The Bears would stretch their lead to 2-0 on their fourth power play of the game with a goal from Mike Sgarbossa at 10:06. Jayson Megna (11) and Ryan Sproul (11) were credited with the assists. Beck Malenstyn would stretch the Bears lead to 3-0 with a short-handed goal at 10:06. Mike Sgarbossa (18) was credited with the lone assist. But Laval would answer with a goal off of a faceoff in the Bears zone. David Schlemko would loft a soft shot from the point that somehow trickled by Vanecek at 14:49 of the second period. The second period would end with the Bears lead 3-1. The Bears led 25-16 in SOG after 40 minutes. Laval was 0 for 4 and the Bears were 2 for 4 on the man advantage after two periods. The Rocket would close the gap to one with a goal from Alex Kile at 2:07 of the third period. Garrett Pilon was clipped with a high stick to the face midway through the final frame, giving the Bears their fifth power play of the game, but the Bears couldn’t capitalize. Riley Barber would add an empty goal late for the 4-2 victory. This was Barber’s 18th goal of the season. Liam O’Brien (7) and Aaron Ness (27) were credited with the helpers. Bears extend their point streak to seven games. Hershey has scored first in 12 of their last 13 games. Three Stars 1) Mike Sgarbossa, 2) Beck Malenstyn and 3) NathanWalker. Laval was 0 for 4 and the Bears 2 for 5 on the power play. The Bears outshot the Rocket 31-21 for the game. Vitek Vanecek stopped 19 of 21 shots for a .905 save percentage. Mike Sgarbossa had a goal and two assists. Aaron Ness had two assists. The last time the Bears were over .500 was January 13, 2018. This entry was posted in Hershey Bears, News and tagged Beck Malenstyn, Hershey Bears, Jon Sorensen, Laval Rocket, Mike Sgarbossa, Nathan Walker, Riley Barber. Bookmark the permalink.